President Rodrigo Roa Duterte discusses matters with Australian Secret Intelligence Service Director General Nicolas Peter ‘Nick’ Warner who paid a courtesy call on the President at the Malacañan Palace on August 22, 2017. Joining the President are Foreign Affairs Secretary Alan Peter Cayetano, Defense Secretary Delfin Lorenzana, National Security Adviser Hermogenes Esperon Jr., National Intelligence Coordinating Agency Director General Alex Paul Monteagudo and Armed Forces of the Philippines Chief of Staff General Eduardo Año. 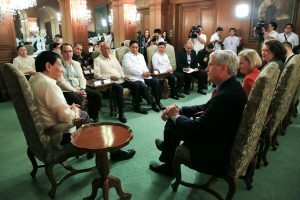 Accompanying Warner, meanwhile are Australian Ambassador to the Philippines Amanda Gorley and Counsellor Caroline Fogarty.